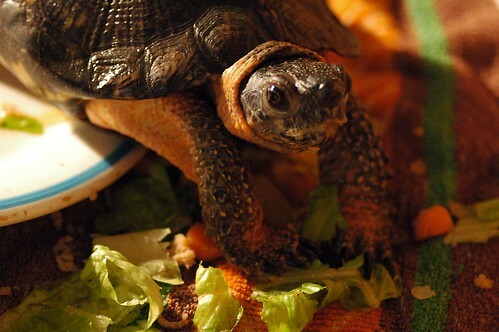 This turtle lives at Sharon Audubon, and apparently for lunch he (or maybe she) likes raw salmon and salad. Sounds good to me too. Tomorrow is monthly theme day in the daily photo family - stay tuned! awwww.. i misss my turtle....i wonder where it is now its been 10 years. :( anyway thats a cute turtle. What a cute turtle. I love how he looks as if he's about to slide off his lunch plate!